We tested the C2750 eight-core Avoton SoC in the ASRock C2750D4I, a system oriented around maximum DRAM and storage in a mini-ITX form factor, and reported on GIGABYTE’s 46x C2750 Avoton server back at Computex 2014. 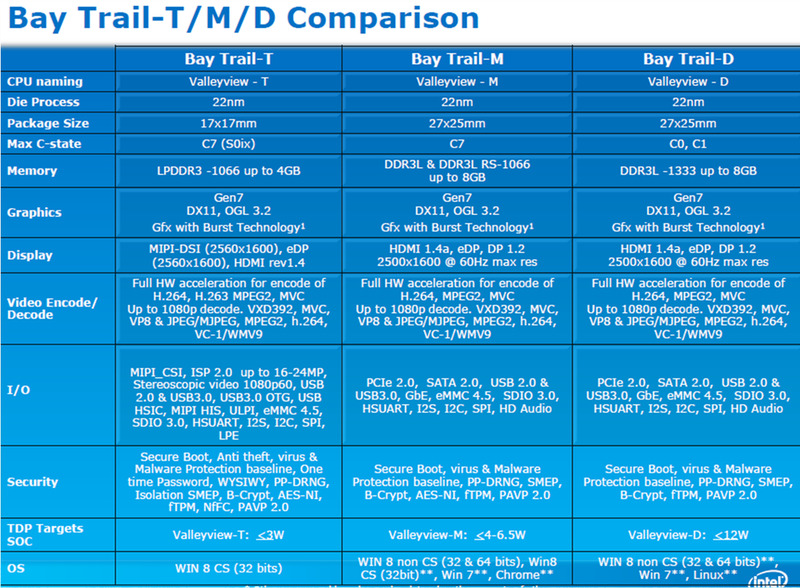 The microserver market is apparently ripe for Avoton, but Bay Trail makes the desktop and tablet spaces a little more confusing. We have covered Bay Trail in Mobile and Tablets, such as the ASUS Transformer Book T100 that has the Atom Z3740 Bay Trail-T, but the casual desktop space is still an interesting market. ECS’ LIVA is a perfect example of this: Ganesh’s review of the LIVA with the 4.5W Celeron N2806 Bay Trail-M shows that with enough innovation, some interesting designs can be produced. 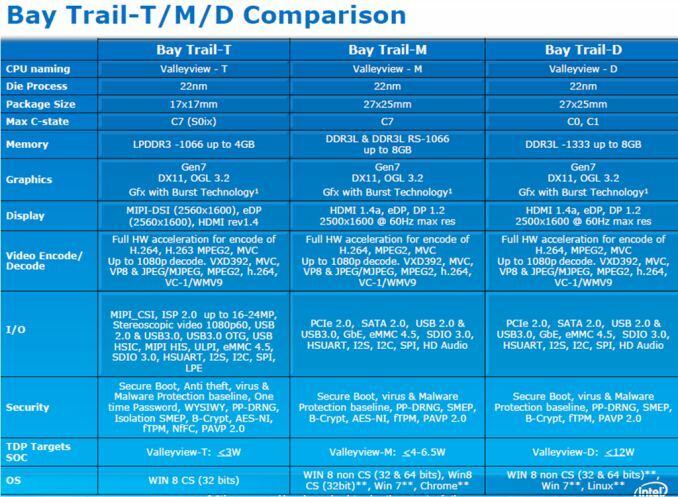 AMD’s main power point for Kabini was the upgradable platform, due to Intel’s Bay Trail involving soldered on CPUs. Memory compatibility is traded, with Intel supporting dual channel but at a lower frequency. Price is also a battleground, along with GPU cores, although Intel uses significantly less power (on paper). 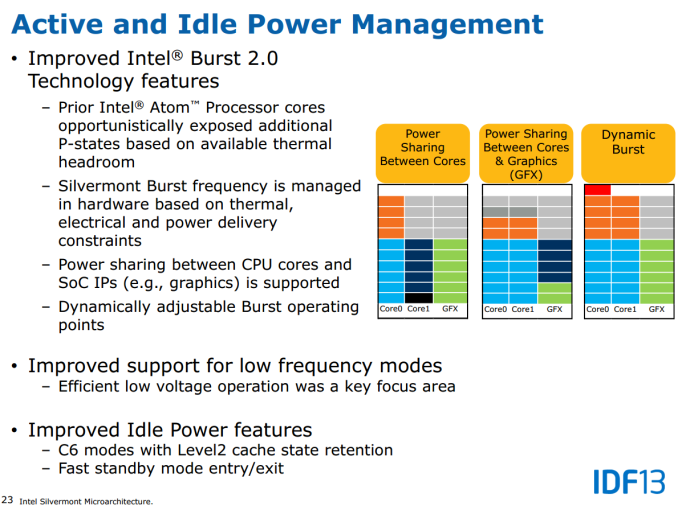 Four Silvermont cores at 2 GHz for 10W sounds impressive, especially when I think back a decade to what I had back at university, or the 35W Core 2 Mobile CPU I had in my last laptop. As we found with the C2750, single thread speed should be reasonable and while multithreaded applications can take advantage, it doesn’t replace an i3, but ultimately that is not the intended market. Both the GIGABYTE J1900N-D3V and ASUS J1900I-C are going for that base desktop market, where ‘some memory’ and ‘some storage’ are needed, such as digital signage, a basic HTPC or run-of-the-mill all-access government machines. The new C0 stepping allows Intel Quick Sync to be used, but aside from the change in stepping (B3 to C0) there is no other outward indication which version is going to be used unless you are a customer that deals with Intel directly. 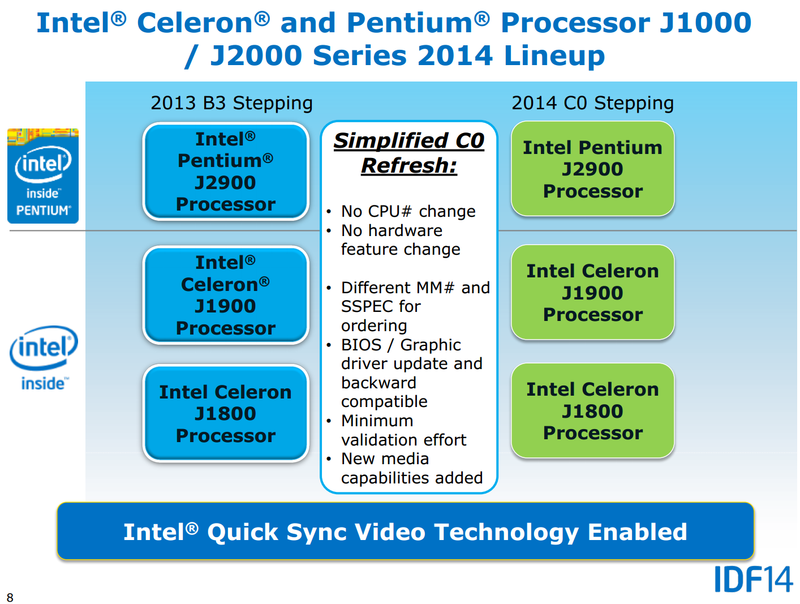 Even though our samples in this review were new, both contained the B3 stepping version of the SoC. Here the System Agent negotiates data between the dual channel DDR3L memory controllers, the Silvermont dual core ‘modules’ and the graphics, supplied as 6 EUs based on the Ivy Bridge video architecture. 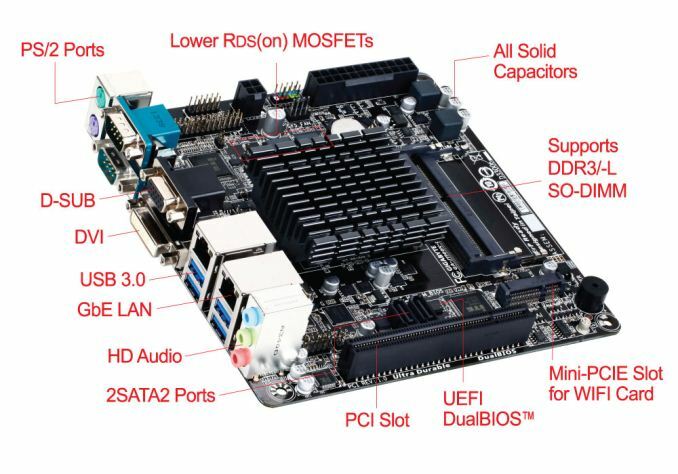 Because the Bay Trail SoC supports far fewer I/O connections compared to our usual foray into consumer based motherboard/CPU combinations, a mini-ITX is enough to almost fit them all. 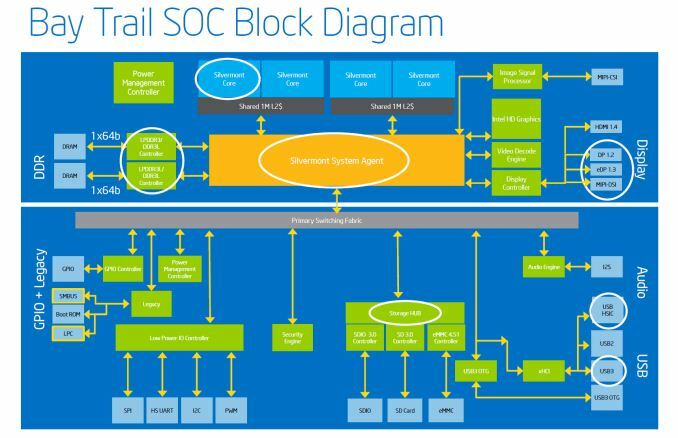 The SoC allows four PCIe 2.0 lanes from the chipset, which the manufacturer can use network connections or other IO controllers for. Here GIGABYTE has used two for Realtek NICs, one for a PCIe to PCI bridge and a mini-PCIe for a WiFi card or similar. The SoC supports two SATA 3 Gbps and a single USB 3.0 port, with this GIGABYTE motherbaord using a Renesas hub on that USB 3.0 to expand the offering to four. Here is where Bay Trail comes across an issue. The system is designed to be cheap and competing with Kabini, meaning that motherboard manufacturers cannot fill the product up with controllers that cost a lot. 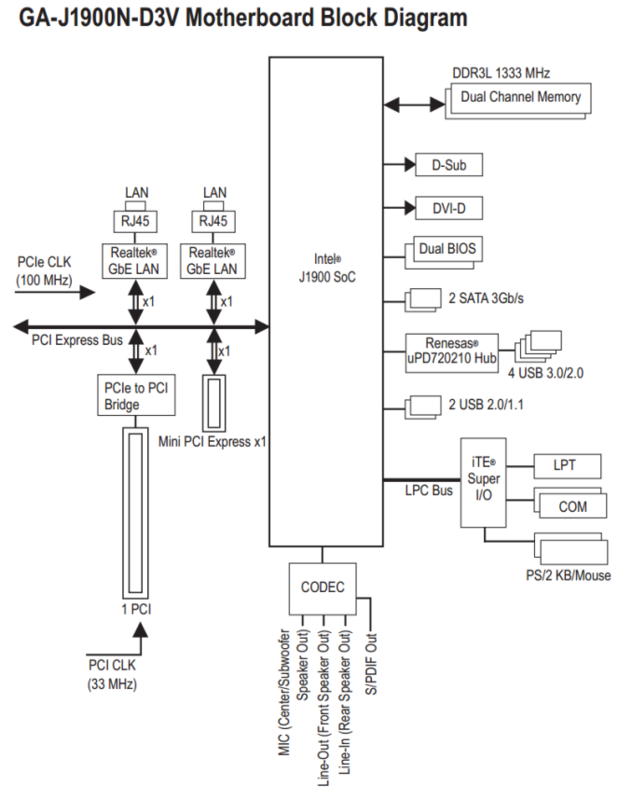 It would be interesting if the PCIe lanes were used for additional SATA controllers, allowing for a large storage system, but that ends up being exactly what the C2750D4I is. Also, the decision here on the GIGABYTE to use a PCI slot will be for legacy use, as the latest graphics card available that uses PCI would be a HD 5450 or GT610/430. - Does it have the right connectors? - Does it cost a lot? - Is it easy to set up? - Is it responsive enough? - Will it compute as much as is needed in a reasonable time? The last two points end up being the usual reason for upgrading. For example, back in the lab I worked in several years ago our vintage equipment (an older version of this) ran on Pentium 4 machines but required a legacy slot for the proprietary communication and control card it ran on. In order to upgrade, it had to meet the above criteria. This is why legacy still exists. Back to the review: we are putting both the GIGABYTE J1900N-D3V and the ASUS J1900I-C through their paces for usability as well as the J1900 SoC for responsiveness. These boards are in the $85-$95 mark, providing a competitive price point against AMD’s Kabini. Motherboards at the cheaper end of the spectrum tend to be worked on by less people, purely because the profit margins are low. Both the motherboards in this review are dealing with the fact that they have to include the SoC on the motherboard at the point of sale. Intel lists the price of the J1900 as $82, meaning that these SoCs are actually sold at a discount or in a discounted-revenue strategy, or the motherboard manufacturers are getting them severely discounted in order to make cents per sale.